Create astonishingly expressive music on a portable, super-powered keyboard. Touch and shape your sound on Seaboard Block's soft, pressure-responsive musical surface. 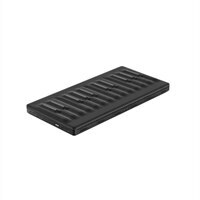 ROLI Seaboard Block MIDI controller USB, Bluetooth velocity sensitive 24 drum padsCreate astonishingly expressive music on a portable, super-powered keyboard. Touch and shape your sound on Seaboard Block's soft, pressure-responsive musical surface.